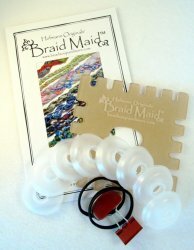 A cool tool for braiding both flat and round braids with threads, ribbons, boutique yarns, fabric strips and metallic cords from fine to thick, even strung glass beads. Our clear acrylic braiding plate has a 5" square profile with 20 wide slots surrounding the oval center hole. Designed for braiding flat braids, the Braid Maid™ also serves well for round cords. The featured 8-strand braids are kumihimo patterns but the softer result is ideal for flexible embellishment for the quilter or mixed media artist. You can't go wrong with ONE braiding tool for multiple uses! The setup comes with the acrylic plate, 8 small bobbins, weight clip, a pair of holding ties for securing working threads for travel and a 16 page pamphlet of instructions and usage tips.